More than 200,000 people made their way to Kiawah Island for the 2012 PGA Championship in August 2012, the largest sporting event in South Carolina history. Many of them, participants and spectators alike, were introduced to the Palmetto State when they touched down at Lowcountry Regional Airport in Walterboro. Lowcountry Regional, just 51 miles northwest of Kiawah, is the state's largest general aviation airport. With three runways ranging in length from 5,500 feet to 6,007 feet, it can easily accommodate all corporate jets, as well as the popular Boeing 737. And, according to Walterboro Economic Development Director Hank Amundson, the airport has a history with golf tournaments other than the PGA. It helped serve the transportation needs of people attending the Masters in Augusta, Georgia, and the Heritage, in Hilton Head, South Carolina, in April 2012. "That was the busiest April we ever had at the airport," Amundson commented. "Some people took a helicopter from here to Augusta, while others got there on smaller planes." He added that rental cars are available at the airport and that a limousine service helped provide transportation from Walterboro to Kiawah. Walterboro Tourism Director Donna Laird cited several other reasons why flying through Walterboro might be more fun and less frenetic than using a larger, more congested commercial airport such as those in Charleston and Savannah. For example, pilots can call ahead and order lunch from one of many local restaurants, and passengers can walk right from the plane to their ground transportation. The airport also has a pilot's lounge and a flight planning room, "just to make the whole flight experience less stressful," Laird pointed out. "A Lufthansa pilot who landed his own plane here told me there isn't any place easier to fly into," she said. Possibly more important than convenience, though, is the cost of putting Lowcountry Regional Airport on your travel itinerary. There is no landing fee, and ramp charges are waived for pilots who purchase fuel, which is $1 to $1.50 per gallon cheaper than at other airports in the area. 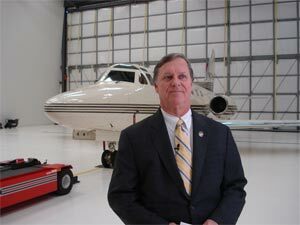 "We have reduced our fuel prices to the lowest in the region for commercial airports," said Bill Young, mayor of Walterboro and, since 1989, vice chairman of the Walterboro-Colleton Airport Commission. "And, since the privacy and convenience we offer is attractive to many travelers, a number of well-known celebrities fly in and out of Lowcountry Regional." The airport, no more than a rough landing strip in the 1920s and 1930s, earned its place in American history during World War II, serving as a training ground both for the Tuskegee Airmen, the nation's first African-American military aviators, and Lt. Col. Jimmy Doolittle's Tokyo Raiders, who avenged the Japanese attack on Pearl Harbor. Today, according to Young, the airport is primed to serve as an economic engine for Walterboro and its environs and fully prepared to offer financial incentives to pilots and to companies that choose to locate to the area. For example, aircraft that use Lowcountry Regional as their home base earn a property tax reduction from 10.5 percent to only 4 percent. "Two jets from Columbia recently relocated to our airport, saving their owners about $70,000 a year in taxes," Young pointed out. He added that incentives also are available to help pay for construction and infrastructure costs for companies that move to the area surrounding the airport, along with tax credits worth up to $4,500 for each job created. In addition, as a member of the Southern Carolina Alliance, Colleton County can offer "additional benefits and opportunities." "We see Lowcountry Regional as an opportunity to bring in good paying jobs for our citizens and to broaden our tax base," Young said. "We believe that we have much to offer aviation-related industries as South Carolina expands into the aeronautics arena." Read more about Walterboro, SC at the City of Walterboro's website.